I was over the moon when Glossier launched its Phase 2 set, including pared-down makeup essentials for everyday wear. (If you haven’t checked it out yet, it’s a must.) Then, on a particularly gloomy rainy day in late April, this trio of brand-new Balm Dotcoms came across my desk. I couldn’t hide my excitement as I quickly unzipped the little pink package and uncovered what appeared to be new flavors of the cult-fave lip balm. Previously, Glossier had experimented with a coconut variety (it ruled), so this launch was a welcome, natural next step. There are three: Rose, Mint, and Cherry. They’re meant to be mood-enhancing, so you can switch it up based on what feels you’re looking for. It’s a mood ring for your lips in that way. The formula is similar to the original: a super-dense blend of castor seed oil to keep moisture locked in; beeswax, which acts as a protective barrier; and rosemary leaf extracts to combat free radical skin damage. But the scents and sheer tints update each tube in a subtle but really fun, nostalgic way. Think Lip Smackers for the 21st century. Thankfully, I was able to express my awe and excitement to Emily Weiss, the cool-girl founder and CEO of Glossier. I asked her how she managed to come up with quite possibly the only three products missing from my overflowing vanity. Weiss explains, “We developed the new flavors internally. Our first venture into flavored Balm Dotcom with Coconut last summer was such a runaway success that we knew expanding on the line was something our girl wanted. So we just picked the flavors we liked best and had fun with it. When I asked which was her favorite (I’m partial to the rose scent), she couldn’t choose. “I can never pick a favorite Glossier product. I will say the flavored Balm Dotcoms are nice because each one is great for different occasions. We say Mint Balm Dotcom tastes like a fresh start, so that one is great to get your day started, Weiss mused. “It’s a crisp morning breeze and a fully charged phone,” as the press release so astutely put it. “Rose tastes unlike any other rose, which is perfect when you’re feeling dreamy and romantic. And Cherry tastes like fun—wear that when you’re feeling playful.” The press release mentions “tangy cherry candies, the perfect playlist, and three-day weekends,” so I imagine Cherry is perfect for when you’re feeling ’70s Jerry Hall vibes. I’d fluff up my curls and smooth on the juicy, dewy red for a saucier occasion. So there you have it, ladies. 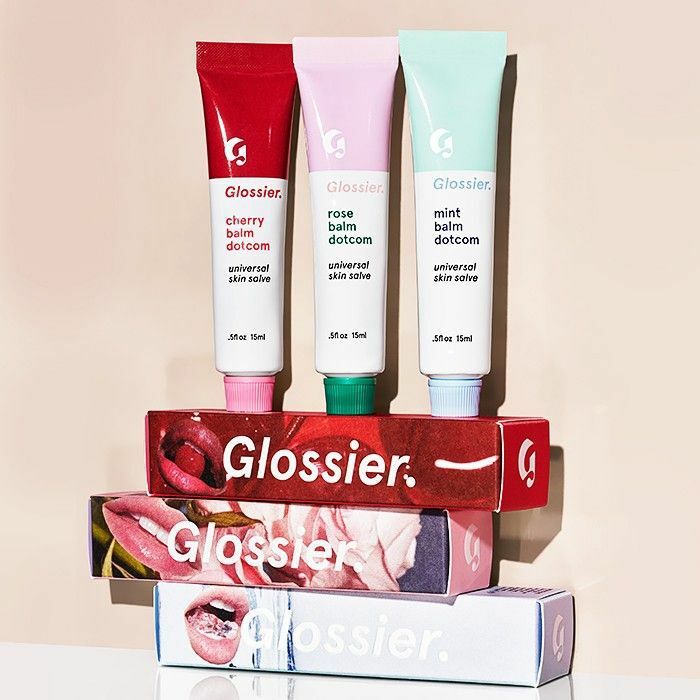 Pick up Glossier’s Balm Dotcom ($12) in all three new scents today! For more throwback beauty, peep at these ’90s trends that look anything but dated.